Pantene Japan, a hair-care brand of Procter & Gamble (P&G) Japan, launched the "#HairWeGo What's Wrong With My Hair" campaign. 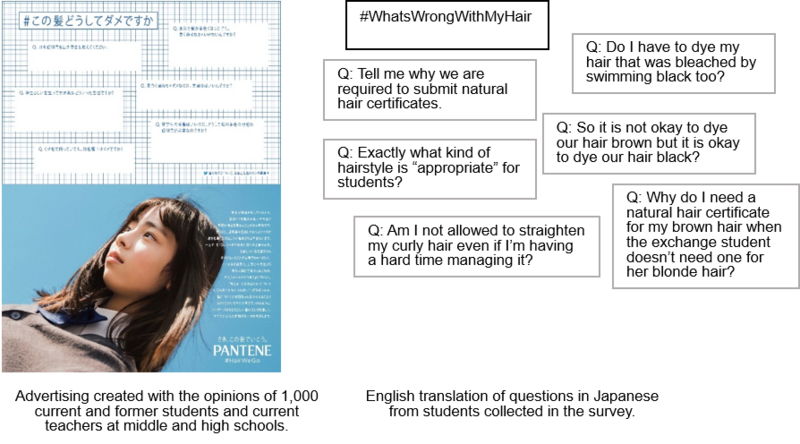 The campaign, launched on the social media, radio, video (YouTube) and newspaper advertising, calls for social dialogue around hairstyle rules in Japanese schools, which include requiring students to keep hair in low ponytails and dye their naturally brown hair black, limiting allowed styles of haircuts, requiring proof of natural hair color and more. Source: Procter & Gamble Japan K.K.